Enjoy a holiday in the Tarn (81), at the heart of the Haut Languedoc Regional Natural Park and the Sidobre, an impressive forested granite plateau. A stunning natural setting and a welcoming local life. 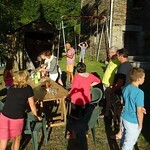 Our gites are close to the GR36 hiking trail that runs along a former railway line and links Castres to Lacaune. If you enjoy fishing you can settle down on the banks of the River Agout, a 'Category 2' river that's home to white fish, trout and pike. Brassac: Revisit the Middle Ages in a delightful town that's home to classified historic monuments including a medieval bridge and 11th Century castle. The town also has a fascinating wickerwork centre. Burlats: History-lovers can explore the classified medieval sites of St Pierre Priory, the Bistoure Tower and the Adelaide Pavilion. Ferrières: Home to France's first Protestant museum, visitors can enjoy numerous events that are held throughout the year. Lacaze: Visit the 15th Century castle and the St Jean del Frech Chapel, one of the oldest in Tarn, with foundations dating back to 972AD. Lacrouzette: The Jean Cros Mineral and Fossil Museum, the granite stonemason statue, the church and the Jacques Bourges workshop all pay homage to the incredible natural resources that define this part of France. Le Bez: A charming village that's home to a 600 year-old mill - the Moulin du Record - and the Maison du Sidobre à Vialavert, where visitors can learn more about local granite production and stonemasonry techniques. Often referred to as 'France's Tuscany', the Sidobre and the Tarn are a rambler's paradise, whether you fancy short countryside walks or longer hikes. This part of France is steeped in history and has an incredible landscape. And once you're back at the Thouy hamlet, you can relax in the pool, enjoy a game of tennis or take a stroll. There are also plenty of other activities in the Sidobre area as well the rest of Tarn. Albi and its Sainte-Cécile Cathedral, a UNESCO World Heritage Site that's right beside the famous Toulouse-Lautrec Museum. - Gaillac, home to the St Michel Cathedral and local Gaillac vineyards and wine cellars.Castres where you can visit the Jean Jaurès and Goya Museums (the latter was the first museum in France to exhibit Spanish art). With colourful houses that line River Agout, Castres is also a must for rugby fans who fancy watching a good game ! The Haut Languedoc Regional Natural Park. We love where we live and do everything we can to protect our natural heritage, local culture and rural communities. This famous regional park is situated to the south of the Massif Central, in Occitanie, formerly known as the Midi Pyrenees. It stretches across two departments, the Tarn and Herault. 3 different climates: Mediterranean to the south and east, Atlantic to the west, continental to the north. - vineyards (AOC Minervois, Saint-Chinian, Faugères) and picturesque villages. This is why we're really proud that our hamlet and 5 gites have been awarded the 'Marque Acceuil Du Parc' label in recognition of our support for sustainable development.